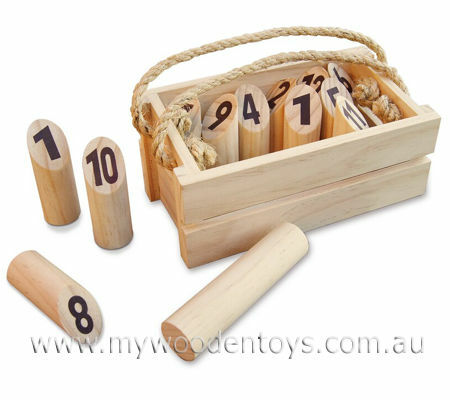 You stand 3 to 4 metres from the numbered pegs and toss the log to try and knock over the number you require. If a player knocks over more than one peg you only score the number of pegs you knocked over. If you knock over 1 peg you score the number on that peg. A player must score exactly 50 points, if you go over 50 then your score returns to 25. This is a simple entertaining game which is wonderful for maths and it is very well presented in a crate with a rope carry string. Size: Pegs stand 7.5cm tall. Box is 20cm long x 10cm wide. We like this because: "Great game really fun."